It wasn't easy to find tickets for "The Tragedy of Man" at the end of the theatre season. The restaging of Imre Madách's work after its debut at the National Theatre in 2002 generates significant interest. This is somewhat unusual for a piece that is commonly regarded as 'heavy', that used to last almost until midnight in the direction of János Szikora. However, all the fuss around a couple of scenes as well as the director, Róbert Alföldi and the remarks at the parliament on his management of the nation's theatre put the new debut right in the spotlight, resulting in sell-outs in case of all five performances of the season, including standing-room tickets. However, there is one seat you can't reserve, because it belongs to Lucifer during the performances of "The Tragedy of Man". Zsolt László took his spot in the auditorium before the start so Péter Blaskó, playing the role of God, can call him up beside himself from among us, mere mortals. As a result of the previously mentioned publicity, most of the audience probably knew that one of the main characters is going to have a seat in the auditorium. This offers a very special, indirect experience to about twelve members of the audience, particularly when this 'satanic being' inches his way to the stage - with an inappropriate politeness. 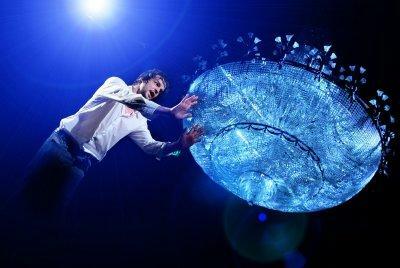 Later, the focus is turned to the auditorium again, when Adam (played by Dávid Szatory) leaves Earth and staggers on the parapet towards the centre of the oval hall, trying not to fall down, while the big glass chandelier descends, stopping at an arm's length above the audience. The performance ends at around 10 pm not counting the standing ovation which took about 15 minutes on March 25. The significantly shortened piece is performed in a very dynamic manner. The key elements of the different scenes (stone tiles, podium, armchair, plush heart) gradually take the stage, drawing a picture of historical 'leftovers' (evoked by Lucifer), with which man has to coexist and find a new faith and/or ideology to commit to over and over again. Adam is seen as a denier of dispair, an idealist who trusts mankind, coming a long way from wearing jeans and t-shirt with Eve (Réka Tenki) in the beginning. Lucifer, wanting to separate them, literally tramples on the bonds between the two, only to guide the young father of humankind from vision to vision. Zsolt László's performance reminded me of his role in Tartuffe, where I also found a sort of undefinable, unique taste which makes his characters particularly human, allowing the audience to easily identify with them, despite the negative personalities (if a direct judgement of value like this is fitting). Showing God is a very significant decision of direction. Péter Blaskó's frequent presence doesn't put the creator of the universe into a faraway trascendental space. You can connect with the grey-bearded old man with a cane, who (through the microphone) still has a thundering voice, and (thanks to the revolving stage) can still change places quickly. Besides them, (and the Eskimo played by András Stohl), the other characters are all played by young, twenty-some actors. A guest from Katona József Színház, Réka Tenki's peculiar character shapes an exciting, clear and mature Eve while Dávid Szatory's convincing performance forms a very present-day young man filled with all enthusiasm and hope that is characteristc of a twenty-some just trying his wings. The openings of the subsequent scenes, featuring dance and singing, successfully wake the occasionally drooping attention. Also very effective are the sensationalist tools like the large crucifix with a glowing red contour upon which the actors climb up and down, or the white convertible deep on the stage, the blasting sand-curtain throwing the sinning pair onto the floor, as well as the huge white panel hanging in the centre which is projected on at several spots during the performance. The 2002 performance omitted the olden closing sentence of the original piece. Instead, a rush of water answered the questions raised by Adam's anxiety. For a moment, this performance seemed to use a similar tool. However, an equally important sentence by Eve ("I feel I am a mother.") is first whispered into Adam's ears, and then, to beautifully emphasize this solution offered by the director, the words are called out loud. In the end, the refreshing and well-executed alterations result in a performance that applies to a wider audience, yet efficiently conveys the original message. There is no doubt, this is much more than just successful marketing with questionable substance. Imre Madách: "The Tragedy of Man"